Today’s tale, “The Frog and the Condor,” is from Peru. I found it at storiestogrowby.com, retold by Elaine L. Lindy in 2006. High in the Andes, a frog lived in a cool stream. The frog was sad because she was different from all the other frogs, her right leg was much longer than her left. There was a cave near the stream where a condor lived. The condor had a girl held prisoner. He had plucked her from the hillside while she was watching sheep and forced her to beat vicuna skins into blankets for him and cook his meals. The frog watched the condor and sometimes followed it back to its home, where the girl’s wailing reminded the frog of her own sadness. One day she overheard the girl ask the condor if she could go down to the stream to wash her clothes. The condor finally agreed to let the girl go, as long as he could hear her beating her clothes on the rock. If the sound ceased, he would know she was trying to run away and fly down and punish her. The frog turned into the image of Collyur, took the girl’s clothes and kept beating them on the rocks. She told the girl to hurry and Collyur ran down the mountain as fast as she could back to her home. After a while, the condor wondered what was taking the girl so long, so he fliew down to the stream and, he believed, saw Collyur cleaning the clothes. He yelled at her to stop and come back now. The girl stood up, jumped into the stream, and completely disappeared. The condor flew over the stream, but didn’t see the girl, he only saw a frog hopping around. The girl made it to safety and after several hours of searching, the condor returned, angry, to his cave. When the frog rejoined her family in the stream, the other frogs all gathered around her. One told her she was beautiful, and the frog saw in her reflection in the water a shiny jewel glittered on her forehead where Collyur had kissed her. Another frog said it looked like the morning star, and from that moment on the frog was proud and never ashamed of being different. On the one hand I like the story. It’s about selflessly helping others and in theory, what makes us beautiful comes from how we treat others. But it took an outward sign, the gem, for the other frogs to recognize how special she was. 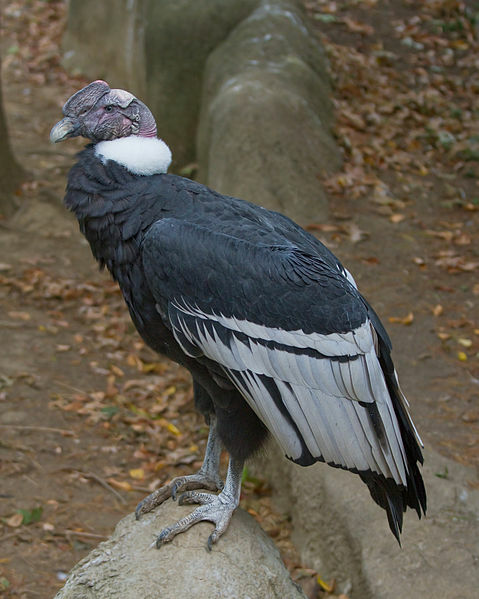 About the animals: The Andean condor is the largest flying land bird in the Western hemisphere. Its wingspan reaches over 10 feet. The range of the Andean condor is along the Andes mountain chain from Venezuela to the Strait of Magellan. The vicuna, prey of the condor, is a relative of the llama that produces small amounts of very fine wool. The species is considered endangered.